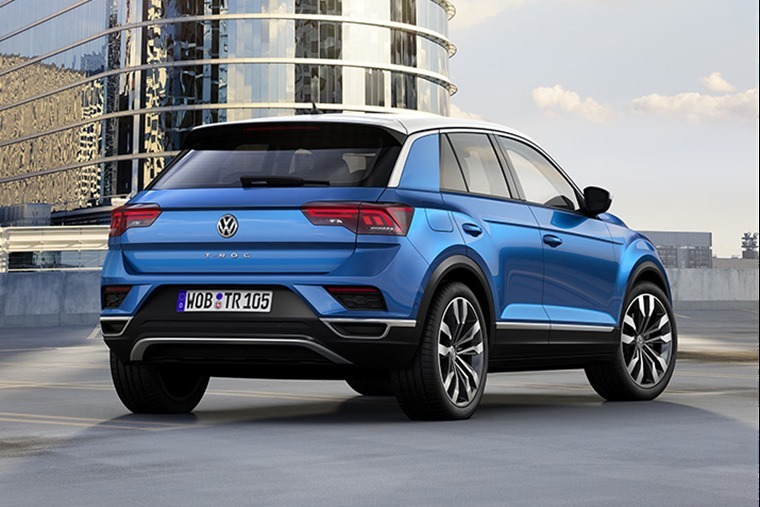 The Volkswagen T-Roc compact SUV is wider and taller than the Golf, smaller than the Tiguan and offers more style and individuality than both. Its raft of personalisation options make it stand out from the crowd. If you thought the small SUV sector was popular right now, Volkswagen reckons it’s going to expand from the current 6.4 million global sales to 10.6 million within a decade. 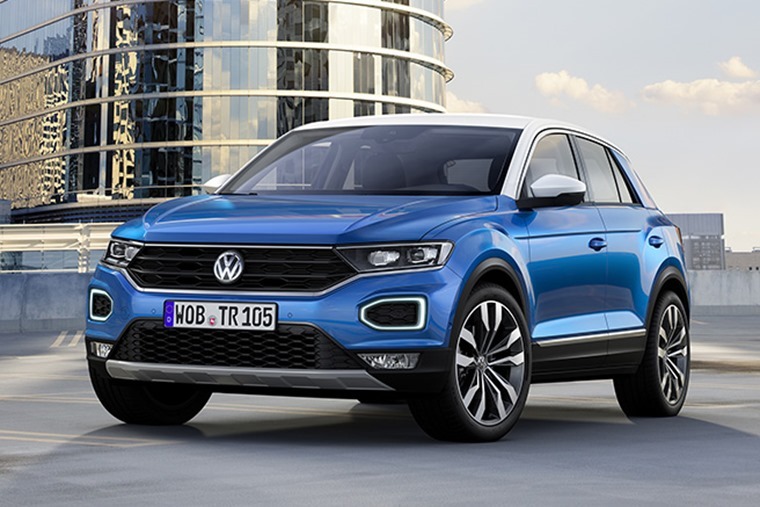 The German firm is doing its bit to fuel that rise with the launch of the T-Roc and it also has its smaller-still T-Cross waiting in the wings. 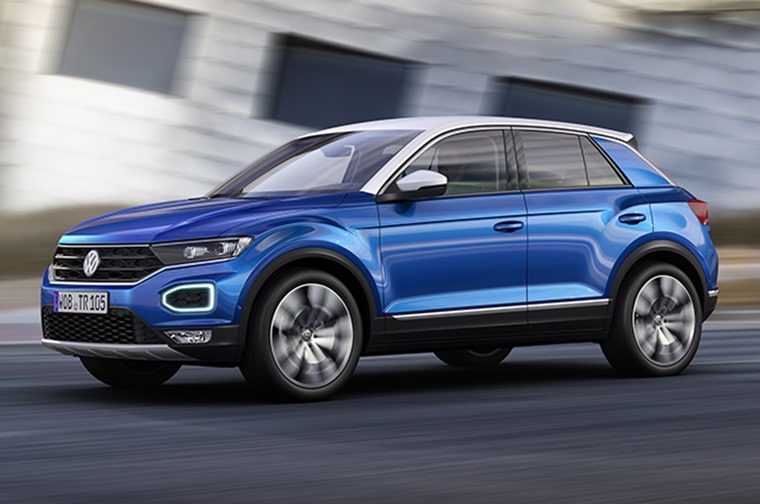 So, where does the T-Roc slot into VW’s range? Well, it’s smaller than a Tiguan but not that much different to the Golf it shares its MQB modular platform with. As a result, the T-Roc is a shade shorter, wider and taller than the Golf. The dash will be familiar to anyone who knows the current Golf. This gives the new small SUV the stance and attitude we’ve come to expect of this class in recent times. VW also claims the T-Roc has a ‘coupe-like’ profile. Hmm, not sure about that as it looks very much like a hatch to our eyes in the same vein as its key rivals in the form the Audi Q2 and Mini Countryman. Ignore this bit of marketing puff and the rear end design offers up a boot with a capacity of 445-litre with the rear seats in place. That’s decent but not as good as the Skoda Karoq’s, so the VW is happy to sacrifice some practicality at the altar of fashion. 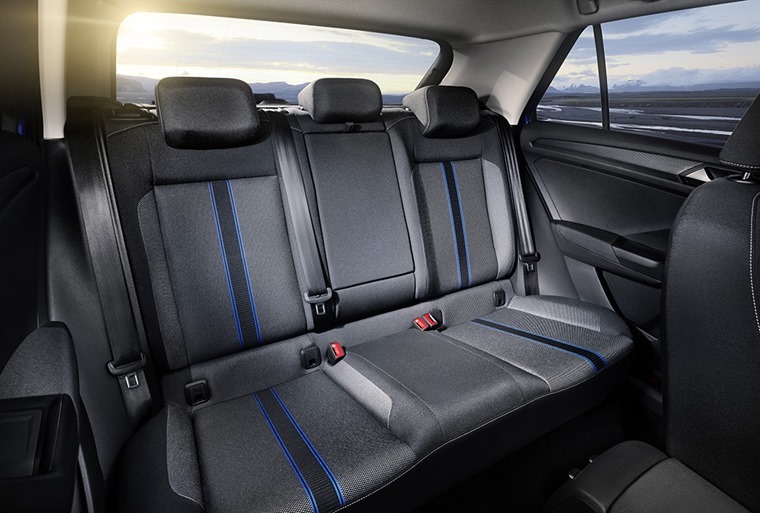 This is also made clear inside the T-Roc’s cabin where the rear bench offers cosy, comfy accommodation for the two outer passengers. However, park your posterior in the centre pew and its raised cushion leaves you feeling perched and with an adult’s head too close to the ceiling. Move into the front of the T-Roc and space isn’t an issue for legs, arms, shoulders and craniums. There’s more than ample adjustment in the seating position and steering wheel for all drivers to get comfortable. You’re also presented with a dash that will be familiar to anyone who has set foot in the current Golf or several other VW Group products using the same MQB platform. For sure, this is a real positive for the T-Roc over some of its rivals. Where the Mini Countryman’s dash can look contrived and cluttered, the VW’s is neatly arranged and easy to navigate. There’s a mass of options for the interior. The infotainment is simple to work and the main dials are clear. VW offers its Active Info Display that lets you configure it to show various screens to select which information you deem most relevant to you. 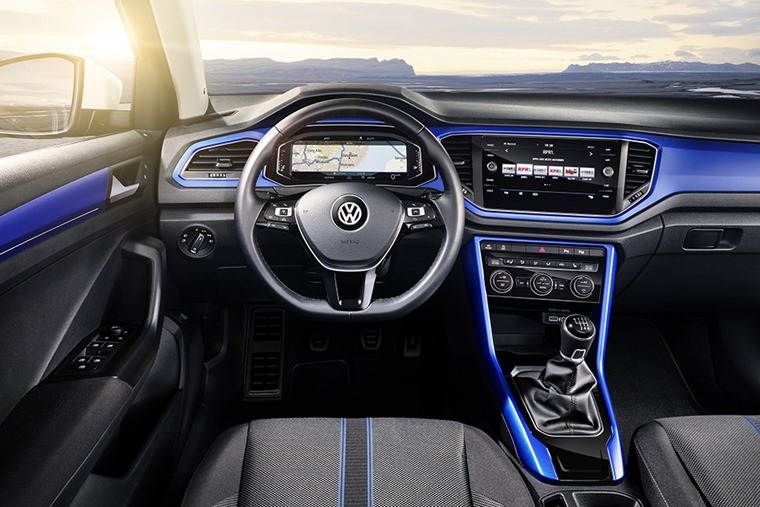 There’s a mass of other options for the interior of the T-Roc and ‘personalisation’ is a word that crops up time and again in Volkswagen’s talk of this car. As well as the expected upgrades for upholstery, infotainment and goodies such as a panoramic sunroof, you can pick from a variety of coloured trim inserts. That approach is echoed on the outside of the T-Roc with a colour palette that’s bolder than you find on most VWs. You can go further with a contrasting colour for the roof and door mirror caps. What about the more fundamental components under the bonnet? There’s a choice of VW’s current petrol an turbodiesel engines and the 1.0-litre 114bhp TSI motor is expected to be the best seller. With economy and emissions of 55.3 and 116g/km respectively for this model with the six-speed manual gearbox, it’s a decent shout. However, we reckon the 1.5 TSI powerplant will be the more rounded and able for anyone who covers a mix of fast and slow routes on a regular basis. As for the 188bhp 2.0-litre turbo petrol, it’s hard to see many opting for this due to its higher cost. The same applies to the most potent 2.0-litre turbodiesel that comes with 188bhp too. Swift it may be, but most drivers will steer towards the 148bhp version that delivers 55.3mpg and 133g/km in DSG form. VW has decided to take up the challenge of rivalling the MINI Countryman’s sporty set-up. There’s also a 1.6-litre turbodiesel. We’ve yet to try this version as Volkswagen is rolling out the engine launch between December and April 2018. We did try the 2.0-litre turbodiesel in both power configurations and it serves up good pace and refinement on the move. There’s a little tell-tale grumble at a standstill and the DSG twin-clutch auto transmission can engage with a very slight shunt, but it’s an easy car to live with. At higher speeds, there’s some wind whoosh from around the door mirror posts, but road noise and other sources of intrusion are kept admirably distant from the cabin. Swapping into a 2.0-litre TSI turbo petrol in 190hp guise and it’s brisk off the line thanks to 0-62mph in 7.2 seconds. It’s a quiet engine in operation too and feels more attuned to the DSG gearbox than the diesel, though in Sport mode it hangs on to revs a little too gamely. Much better to leave the car in Comfort mode and enjoy the broad spread of power that lets you drive the T-Roc while making relaxed, nippy progress. Even so, you will have to reconcile yourself to a ride that’s on the firmer side of acceptable. Compared to the cushy brilliance of the Skoda Karoq, VW has clearly decided to take up the challenge of rivalling a Mini Countryman’s sporty set-up. 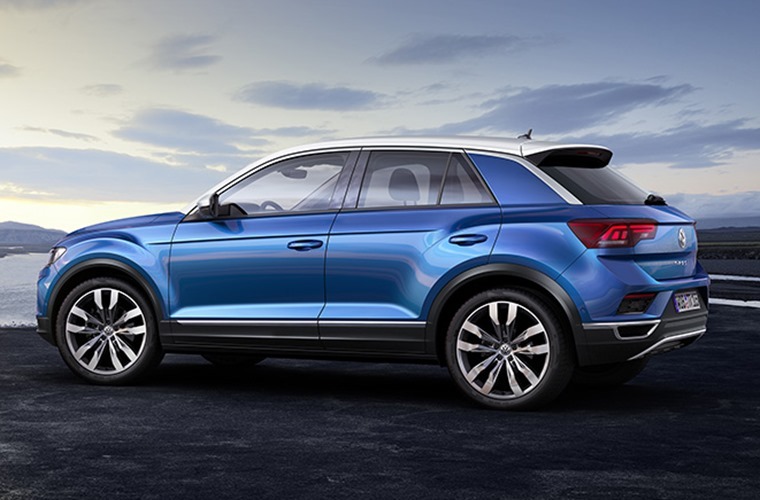 It works inasmuch as the T-Roc resists lean in bends, holds on tenaciously when cornering and feels sure-footed. However, there’s little by way of steering feedback and the pay-off the agile handling is a ride that doesn’t settle on broken tarmac. It’s right up there among the class leaders. 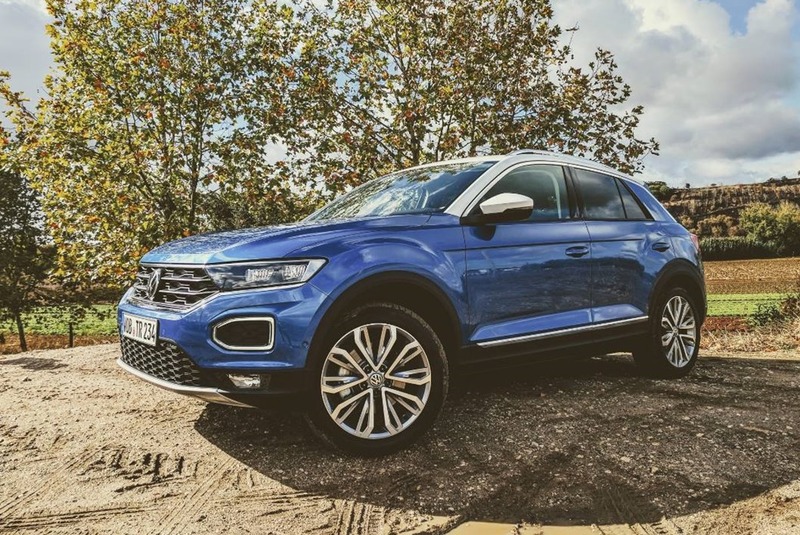 The T-Roc is by no means unique in this respect in the small SUV sector. Still, we’d willingly trade some of that handling ability that you can use once in a while for a more supple ride you enjoy on every journey. If this sounds like the T-Roc might not be among the class leaders, that’s not the case. It’s right up there and anyone considering an Audi Q2 or Mini Countryman would be daft to ignore the T-Roc. This small SUV may not have the immediate appeal of those rivals, but it will undoubtedly attract more drivers to the VW badge and do its bit to swells sales to that 10.6 million prediction.